Dream Your Ride : May Is Motorcycle Awareness Month - Good Luck With That! May is “Motorcycle Awareness Month” and there are other campaigns out there that attempt to “convince” drivers to watch out for those of us who chose to ride “naked and exposed” on our motorcycles. They have and will continue to FAIL and here’s why. The idea that motorcyclists “share” the road with cars is ridiculous. Drivers have little intention of sharing the road with anyone but other cars and even that’s a stretch. Drivers are fine with us being on the road as long as we stay the hell out of their path. In reality the typical driver gives little if any thought to the motorcyclist and why should they? The typical driver rarely encounters a motorcycle and the sad truth is he or she is more likely watching for a deer or a dog running in front of them. Lets look at the car itself. The average car is loaded with distractions to keep the driver occupied from the mundane task of watching the road and guiding the car. They have individual climate control, cruse control, seat heating, satellite radio, CD, MP3, ipod, GPS guidance and personal theater systems that the driver can control. Let’s not forget cruise control. On top of all the gadgets, the driver will likely be talking, texting or accessing the Internet while fiddling with the gadgets in the car. This gives the driver little time to look out the window, use turn signals or watch out for motorcycles. Sure, there are laws against distracted driving, including stiff fines for talking or texting while driving, however most people still do it and it's only when tragedy strikes that the laws come into play. There is a continual push to educate drivers and have them see and avoid hitting us and yet motorcyclists are still being hit. I’m all for making it safer for me to ride the highways and byways built for cars; however educating drivers to watch for us will do little. There are too many of them to educate and most already think they’re the best driver on the road. A car and a motorcycle meeting at the same time in the same space, cause the greatest number of accidents involving motorcycles. The numbers tell us it’s usually the car that’s in the wrong, with the car either turning in front of the oncoming motorcycle or failing to yield at an intersection. Motorcyclists are also at fault for accidents with other cars, usually due to having the attitude that drivers will and must watch out for them. This mindset is dangerous and often fatal. While driving the family car I’ve had motorcyclists suddenly come into my lane, inches from the bumper, without so much as a signal or a look. 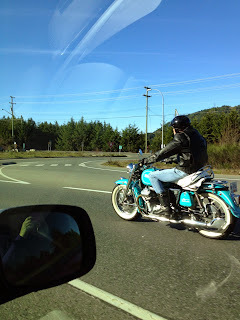 My wife took this picture because she loved the color and look of this Moto Guzzi that was merging onto the highway. Right after the photo was taken the rider made an abrupt maneuver to the left in front of my car without so much as a look. Fortunately for him I was slowing down to give him space and even though he still had more room in the merge lane, he cut over. The sad and scary statistic is in many of the accidents that occur, the driver of the car or the rider of the motorcycle was under the influence of alcohol or drugs. This should be sobering and if it isn’t, well… it should be! Yes there are laws that tell people not to operate a car or motorcycle while under the influence of alcohol or drugs, like there are laws in most areas that tell people not to text, talk or access the web on a device while driving. Those laws have FAILED! Why? Because people think they’re safe by doing those things and they also realize that there are too few police to enforce the laws. No one is more shocked then the driver when they do cause an accident. Thousands die each year as a result of driving under the influence and / or being distracted and people still don’t get it! Here’s how I see it. I’m in the best position to keep ME safe on the road and I would rather improve my riding, observation and avoidance skills then rely on the education of the car driver. By riding clean and sober I improve my chances of staying safe and alive significantly. Other riders have the same choice and power. This alone will reduce the number of accidents involving motorcycles. Remember any “interaction” between a car and motorcycle will end badly for the rider of the motorcycle, regardless of who’s at fault. It’s me against them and I’m going to win! Ride sober, ride aware and practice how to avoid a collision with a car. That's the only sure way to be safe on the roads. Drivers have to be fine with cyclists being on the road. Road is not just for cars. DUI law is the most dynamic and complex area of litigation in the criminal law. These laws change frequently. The legislature makes changes to DUI laws almost every year. Be sure your Lawyer is up-to-date on DUI Law. My sister is an intern with a Los Angeles DUI lawyer. Let me know if you need any help. I agree that drivers must be fine with motorcyclists being on the road, however what should be and what actually takes place is quite different. I can also appreciate the dynamics of DUI in the area of litigation. My goal and hope is that I will never be in a situation where a lawyer is necessary and that my fellow motorcyclists appreciate and understand that regardless of fault, a car vs. motorcycle "interaction" will always end badly for the motorcyclist. Heated Grips - They're Worth It!